Add yeast into flour. Pour in warm water and mix well into a paste. Then cover with a wet cloth for 1-2 hours till foamy to become proved yeast paste. 1. Mix ingredients B. 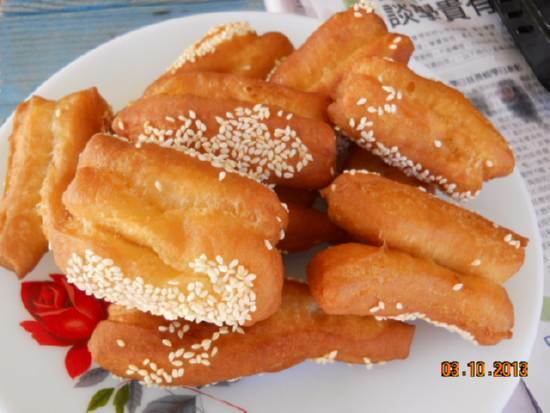 Mix well yeast paste and sugar of ingredients A. Add in B and mix well. 3. Cover with a wet cloth for ½ hour. Add in a little flour. Turn over to proof for another hour. 4. Sprinkle some flour on a table. Roll out dough into a rectangular sheet. 6. Cut into small strips. 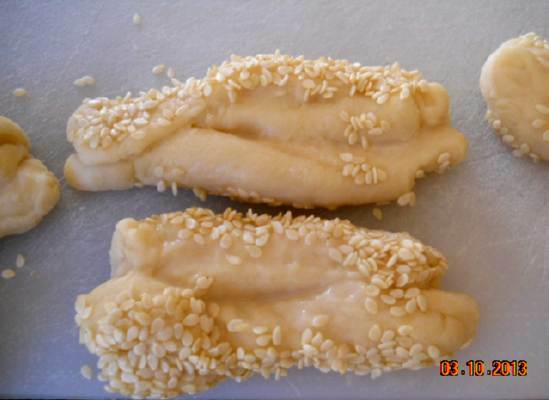 Brush some flour paste on both sides and sprinkles sesame seeds. 7. Deep fry till golden brown. 8. Drain off excess oil.